We explored a lot about Vision, some about Sound, Taste, and Magnetism. Here are resources to follow up. We explored how our eyes only compare cells with three different color sensitivities – red, green, and blue. We explored how our eyes hold onto images for just a moment, which enables us to mix colors and leaves trails in our eyes, fooling us into seeing mixed colors, darkened lights, or even to draw shapes! If you have a computer with a camera, you can “look back in time” using the same idea – persistence of vision, just extended forever. 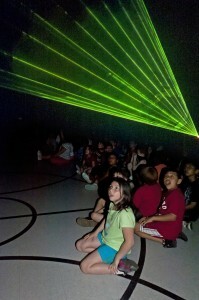 Grab a flashlight and dance! Do we really know all that we think we know? How much is assumptions transferred from other domains? You probably received a mirror, which serves lots of purposes. Fill an aquarium with water. Then drop a few drops of milk into the water. It really doesn’t take much. 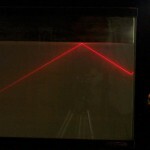 Have one student spray water in the air while another student aims the laser at a mirror. Try to avoid spraying the mirror with water, although you’ll get interesting reflections if you do. We don’t have a sense of magnetism, yet we all sense magnets. How? Using other magnets! For an extra special sensory activity, you should have received TWO magnets with a funny texture to them. Can you feel it? The Sheppard Tone is a beautiful example of how our minds decide what notes we are hearing, and sometimes get distracted. What do you hear? Is it possible? We often use multiple senses to decide what we think is really happening. Listening is no exception. We get a lot of information by seeing someone speak, and that changes what we hear. once with your eyes closed. 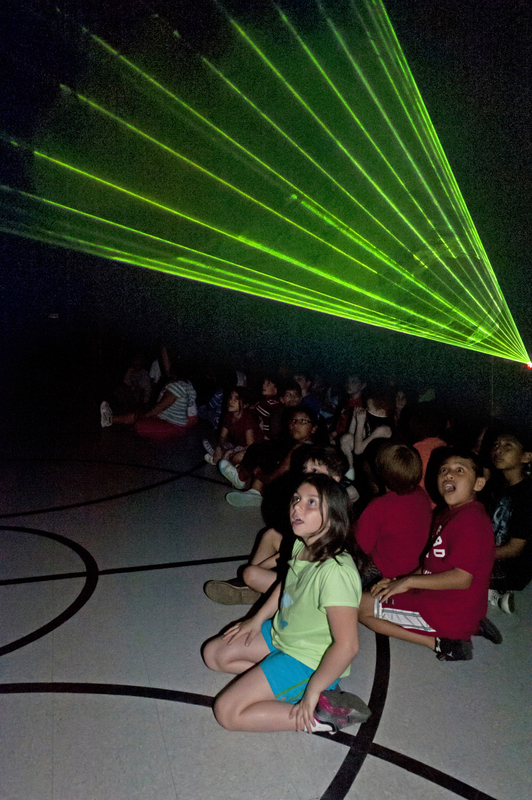 At our LaserScience shows, hundreds of students enjoy seeing beams shooting overhead. This is only possible because there is a fine mist spread through the air. In the dark, nobody minds. Nobody coughs. When we turn the lights on, folks often start to cough! Again, our vision wins, and our brains let our eyes decide what we feel! In fact, we often misremember what we saw if it conflicts with our our mental models. Eric Mazur did some great research with college physics students; unless students were forced to challenge their assumptions before seeing a demo, about 20% of students would remember the wrong outcome of physics demonstrations!